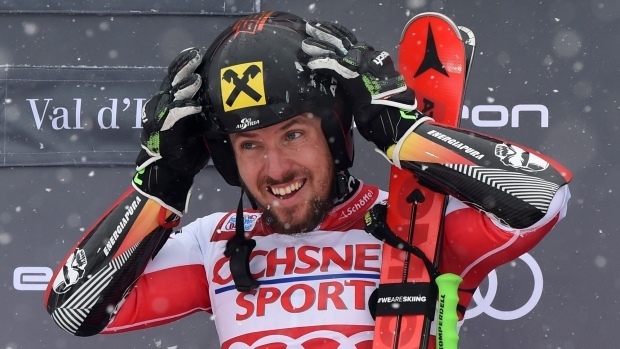 VAL D'ISERE, France — Marcel Hirscher dominated yet again in the World Cup on Saturday, winning a giant slalom by a huge 1.18-second margin. Calgary's Erik Read finished the race in 12th place. In the first run, he finished 26th making him start in the first few in the second run. He kept the leader position for a while, sitting in the first place position, until he was eventually bumped down. "I knew I was going to battle with the really low cloud conditions and all the snow on the course this weekend," said Read. "My first run was challenging especially since the snow was a lot softer and aggressive than what we are used to here in Val d'Isere so I had a tough time really finding my rhythm but in my second run, I pushed out of the gate and just tried to link it all together from top to bottom. I'm really happy with my day."